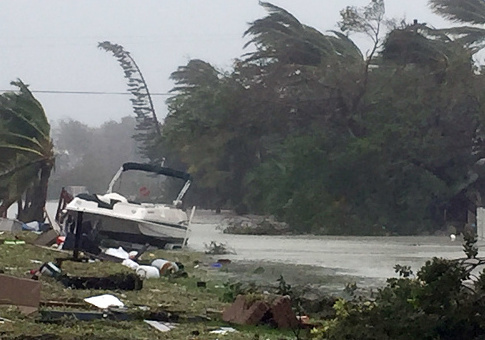 An anchor with the Arabic language news channel Al Jazeera posted a video on Facebook Friday with a caption that referred to Hurricane Irma's destruction as a sign from God. 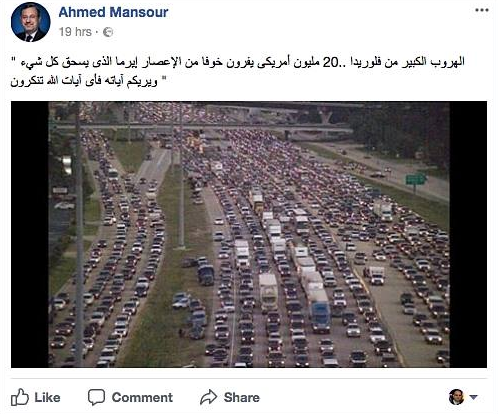 Ahmed Mansour posted a video depicting the Florida evacuation, and wrote in Arabic, "Great escape from Florida … 20 million Americans fleeing for fear of Hurricane Irma, which is wiping out everything in its wake." He then quoted a Quranic verse: "And He will show you His signs, and what sign of Allah will you deny?" Commenters on the post blasted Mansour, pointing out that he did not make such pronouncements when disasters hit Muslim countries. One Miami man pointed out the significant Muslim population in the region displaced by the storm. Mansour deleted the Facebook post, and a tweet, with the same message. In a series of tweets, he insisted he was taken out of context and apologized to anyone who was offended. My tweet yesterday about hurricane was completely taken out of context by some who misunderstood my intention and attacked me unjustifiably. If my post offended anyone, I'm sorry. I assure you that I didn't intend to belittle such calamity that affects the lives of so many people. This entry was posted in Culture and tagged Ahmed Mansour, Al Jazeera, Hurricane Irma. Bookmark the permalink.